Romantic and totally and trendily restaured Beach Bungalows in the west of Ibiza for rent, directly at the two sandy beaches Cala Gracio and Cala Gracioneta overlooking the sea with stunning sunset views, in a quiet and privileged waterfront location just between 2 nice sandbeaches. The whole day the sun shines on our great terraces a tropical garden with a great poolaerea. The Beach Bungalow has panoramic seaviews till the mainland. it is located just 30 meters between 2 lovely sandbeaches, with a BBQ aerea and a great poolaerea. The infrastructure is great, in a few minutes you are able to reach 2 nice beachrestaurants and several others of all quality levels. Further there is the ossibility to practice all kind of sports just nearby. A bus station and 2 supermarkets are in a walking distance and medical assistance is just nearby. Beautiful location. Nice swimming pool and garden in a quiet area. Bungalow was a little bit dirty. No supermarket close by. But overall we had a wonderful stay. If you're looking for a vvvvery relaxing place, no to far away from shopping and terraces, this is it! Don't expect a lot of luxury and sparkling nightlife here. Come for the vieuw, the tranquility, the charming houses, the pool... you have it allmost all to yourselve, and everything you really need is there, so if that isn't luxury.... The Bungalows and surroundings are exactly the way they look on the pictures and also agree with all the other revieuws. No dissapointments here; what you see is even less then what you get. We will be revisiting soon! Having just spent an idyllic week at the bungalows I had to write to say what a fantastic, beautiful location these little gems are in. Katrin and Jan are on hand but in no way intrusive, lovely big smiles to greet us and very low key. The pool was 'ours' for most of the week, and can never be very busy anyway. It was clean and so inviting after a very hot spell of weather. The bungalows could do with a bit of updating, splash of colour here and there, new cushions etc but hey, they have everything you need, bed was comfy and the blissful extravagance of aircon was a huge plus too!. The reason we chose this accommodation was for the view, as I'm sure is the case for most people and by golly do you get one!!! The sunsets were absolutely magnificent, the 2 coves clean, tidy and so so scenic. Must mention the bar on the larger beach too - friendly welcoming staff who spoke amazing English and the food was lovely and very affordable. In a nutshell YOU NEED TO GO HERE! Mark and I will definitely be back next year. Thanks Katrin and Jan and keep up the good work!! Excellent location, but very poor accommodation. These bungalows are in a beautiful location with great views from the private terrace. There is also a private swimming pool for the 4 bungalows and the house that make up this complex. We stayed in Bungalow no 4 having first been offered no 1. My wife's heart sank when she first saw the inside of this bungalow. Admittedly it had not yet been cleaned when we arrived but the owner suggested that no 4 was better, and we should drop our cases off in no1 and return in a few hours when they had both been cleaned. Sure enough the bungalow had been cleaned when we returned but unfortunately there is a big difference in been cleaned and being clean. Dust on the louvre door slats, dust on the light bulbs, stains on furniture throws, cushions, carpets and bedding. Clean towels but stained with hair dye, four coat hangers in the wardrobe, and a shower mat still damp. Not to mention basic crockery and utensils, including 2 mugs (one chipped and cracked), two glasses (one chipped), one desert spoon, and no tea towel. Most disconcerting was clear evidence of attempted break-ins with jemmy marks round the doors and windows, and now ill fitting windows. Wifi? Well although advertised it doesn't exist. The owner says she is having it installed next year! The outside area and location is great, but more attention to cleanliness and decor on the inside is necessary in my opinion. Would we return or recommend? Certainly not, but I would recommend that some serious refurbishments are performed and basic cleaning regimes are in implemented. This could be a great place to stay if only it was viewed as providing an excellent customer experience rather than the commercial venture that it clearly is. We just got back from a wonderful 10 days staying in one of the 2-person bungalows and it was definitely one the most beautiful idyllic spots I've ever visited. The bungalows are situated between two gorgeous little beaches, and the sunset views from the private terraces are truly breathtaking. Accommodation is basic but clean and well equipped, could perhaps do with an update in the near future to make the place a bit more glamorous and comfortable, but this is not prohibitive as the location more than makes up for it. We spent most evenings relaxing on the balcony with a nice glass of wine and a BBQ, but it is also just a short walk from San Antonio and all the bars and restaurants there if you are looking for something a bit more lively. The owners were friendly and attentive, and happy to help with anything we needed. Overall, brilliant holiday! Would recommend this to anyone. The Gracionetta Bungalows are brilliantly located for a holiday on the west coast of Ibiza. The accomodation is basic, but charming and rustic, typically Iberian and exactly what we were looking for. The living space was plenty big enough for two with small bathroom and kitchenette. Four bungalows and a villa share the lovely swimming pool surrounded by a pretty little garden and the amazing secluded terrace had beautiful views of the beach and the ocean, where we ate breakfast each morning and could sunbathe privately on sunny afternoons. We couldn't see the suset from the terrace itself but it was only a short walk to a nearby viewpoint. Cala Gracio and Cala Gracionetta are small beaches, beautiful and unspoilt and literally only a few steps away from the bungalows. The area itself is very quiet but there are little gems to be found, like La Chiringuito the gorgeous restaurant on the beach. San Antonio is the nearest resort but wasn't what we were looking for from Ibiza so found plenty of other, more chilled places to enjoy the sunset; the best places were La Torre, Sunset Ashram and Khumaras and Ibiza is such a small island that we were easily able to travel around. IbizaTown is only about half an hour away by bus or taxi. This was a perfect place for a chilled holiday, the views from your very own terrace were amazing and the people on the island are wonderful. Would definately go back again and again! 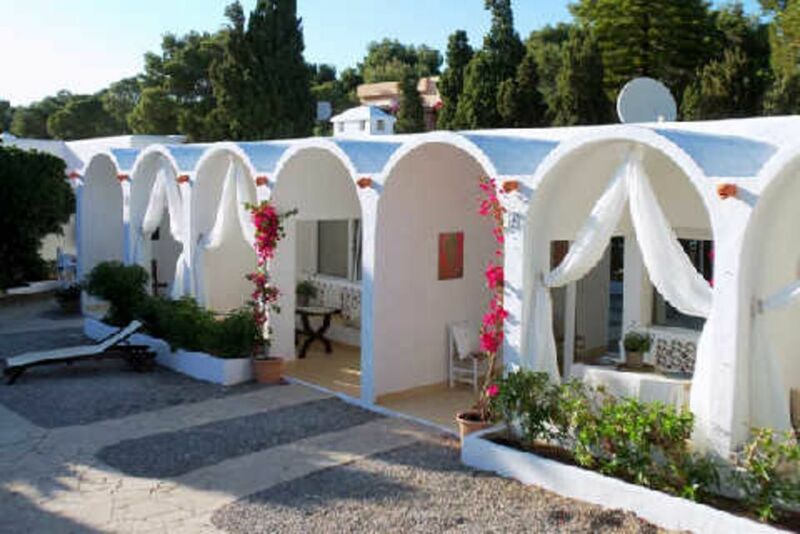 The small and individual resort is situated in the west of Ibiza directly between two beaches. The location has a good infrastructure. In approx. 250 m distance to the holiday resort you have the possibility to play tennis, scuba diving, horse riding, volleyball and do several more sport activities, supermarket, besides you will find famous fish and beach restaurants closely.